Happy solar new year! Today’s the first full day of spring according to the usual zodiacal reckoning, with the spring equinox having happened yesterday afternoon in my area; if I timed it right, this post should be coming out exactly at my area’s solar noon. I hope the coming year is bright and full of blessing for all of you. I’m taking the day to celebrate, as well, and not just for the freshness of the new year. Since the start of the calendar year, when I made that post about a sort of feast calendar for geomantic holy days, I’ve been busy coming up with an entirely new devotional practice. It’s not really my doing, but it’s a matter of inspiration, and…well, it’s an impressive effort, even by my own standards. As part of it, around the start of the month (fittingly, the start of this current Mercury retrograde period! 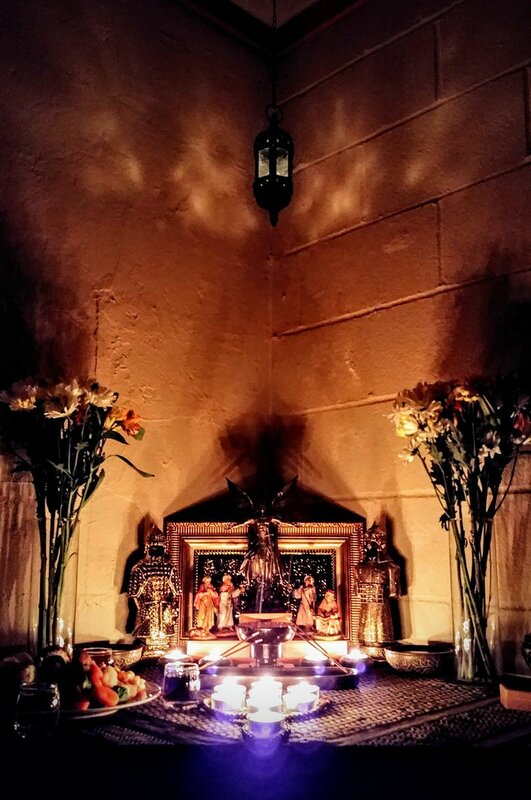 ), I undertook my first celebration of the Feast of the Blessed Dead, my own recognition, honoring, and feasting with the blessed ancestors of my kin, faith, work, and practices. And, of course, far be it from me to pass up a half-decent photo op. According to the scheme I made for a geomantic calendar, after the Feast of the Blessed Dead at sunrise begins the Days of Cultivation, 16 days of prayer, meditation, study, fasting, purification, and the like. In a way, it’s kinda like a kind of Lent or Ramaḍān, but at least for only 16 days instead of a lunar month or 40 days. After those are done, it’s the Feast of Gabriel the Holy Archangel, Teacher of the Mysteries. Which happens to coincide (either on the day of or day after, depending on the exact time) with the spring equinox. Yanno, today. So I’m quite thrilled to bring this ordeal to an end and take things easier again—especially after a good two hours of prayers, rituals, and offerings this morning—but I can’t take it too easy; one of the many benefits I’ve been seeing from doing this practice is that it’s forcing me to get back to a daily practice again, something I’ve been meaning to do now that I have the time again in the way I want to but just haven’t. So, I decided to try contemplating the figures again, except this time, I brought a lot more of my art to bear (I wasn’t really a magician back in those days!) and fit it within the framework of this burgeoning devotional practice, calling on my guardian angel as well as the archangel Gabriel, that famous celestial being who taught the founders of geomancy their art, to help me understand the figure through its mysteries. The process was, fundamentally, the same, except with some preliminary and concluding prayers (which helped in ways I would never have conceived of even a few months ago, much several years ago): visualize the figure, see it form a door, mentally go up to the door and knock, open the door, and go on through. I augmented this process by using the geomantic salutes as well as by intoning the epodes for a figure and reciting the orison for a figure (16 short hymns of the figures, available in my Secreti Geomantici ebook!) for an all-around way to get as much of me engaged in the process as I could without breaking out into a fuller ritual involving incenses or candles or the like. For the order, I used my trusty elemental ordering of the figures according to their primary and secondary elemental rulerships, based on the structure of the figures rather than their planetary or zodiacal correspondences. So, I started with Laetitia on the first day, Fortuna Minor on the second, Amissio on the third, and so forth, up until Tristitia on the last and final day. I was looking forward to seeing what new knowledge I could get, getting reacquainted with these figures I see and use so often in my work, maybe even revisiting the same scenes I saw so long ago. Interestingly enough, that wasn’t the case. Instead, what I was shown was a city, a vast metropolitan city filled with skyscrapers and towers that came to an abrupt end at a single, long road that ran from an infinite East to an infinite West, on the opposite side of which was an equally-vast forest, filled with every kind of tree and bush and plant imaginable. Every figure-contemplation took place along that road, dividing that vast city and that vast forest, but every figure-contemplation was drastically different: time of day, weather, what was happening, the condition of the city; heck, there even seemed to be a notion that sometimes years or even decades would pass along that road between visualizations. In a way that caught me off-guard, the elemental ordering of the figures I used told a deep, intricate, and coherent story of the flow of time of that place, between the metropolitan inhabitants of the city and the autochthonous inhabitants of the forest, ranging from celebration to war to cataclysm to peace and all the things between. In a way, I guess I was revisiting the realm of Via itself. After all, the fact that all these visualizations took place along a Road was not lost on me, and seeing how this figure is often considered to be the first figure of geomancy in the historiolas that we have as well as having all elements present, and that I was using an elemental ordering of the figures to arrange and schedule my contemplations of them…well, I guess it makes sense, in retrospect. I didn’t want to give a whole new set of intricate visualizations, much less share some of the intimate things I witnessed in each contemplation, but I did want to share a few things with you from what I saw: primarily, the form of the door that formed for each figure, and a brief lesson to learn from each figure. The doors you might see in your own contemplations may well be different, but I figure that giving some sort of description for what to expect could help. The lessons were, for those who follow me on Twitter, shared day by day in a short-enough form to encapsulate some of the high-level important messages that I could deliver from each realm of the figure. Perhaps they, too, can be helpful for those who are learning about the figures, or want something to start with that they can expand on in their own meditations. There are always reasons to celebrate, but celebration need not mean partying. While some take time off, others still serve, and they too have cause to celebrate. To truly celebrate is to rejoice in work, channeling hope into power; true praise of God is praise through Work. Don’t chase after sunsets. Diminishing returns will waste you time, and time is something you can’t waste anymore. All we have is all we have; prepare when you can, make do when you must. It’s all we can do to look after ourselves and our own; find independence through community. Better to be homeless in loss than to build a home on it, lest your foundation sink into quicksand. Refugees, divorcees, ex-employees, we all suffer loss time and again; it hurts, and it hurts to stay and it hurts to go, but in accepting loss, we leave loss behind. This world is meant to end, and yet we are meant to make it last. We must do what we can when we can—but at the proper time, and no sooner? Collapse early, avoid the rush. Loss is nothing compared to perdition; how simple we are to focus only on the now when all else is at stake. Enthusiasm can wash over any disaster like an opportunistic wave, but when faced with actual problems, it can end in dashing oneself against rocks in order to break them, or fleeing to fight another battle and another day. Waves will break and scatter but overwhelm all the same. Unbridled desire is like air, stale though thinking it’s fresh, trapped in a cyclone that wrecks damage it cannot see. Over and over it runs roughshod over all, consuming and hurting all. Only true fresh thought clears the air, bringing helpful change instead of harmful calamity. In war, all else looks like peace; in peace, all else looks like war. It’s in the liminal space between them, a blue hour of life, that everything and everyone can come together as equals. Not as allies, but as equals in crisis, equals in opportunity, equals in assessment. Beauty is an emergent property out of assessment, union, and work. We don’t find beauty; it finds us, when we’re in the embrace of equals whom we don’t just acknowledge but truly know are our equals. Beauty is a property of truth, and truth comes from acceptance of the world. Every infinitesimal moment has infinite potential, every one a knife-blade, a parer of possibilities. In each moment lies every potential of every kind of action; it’s up to us to take it, transforming the world and ourselves. Geomancy isn’t called “cutting the sand” for nothing. After we (re)build, the dust settles, and we can see clearly; purity of the heart leads to purity of the mind. We hollow the church, and fill the world as a monastery, living in peace to remember and re-member. But don’t forget: believing we have peace doesn’t mean we really do. Love leads to peace, but without further direction, leads to inertia and languor. Utter clarity of vision leads us to live utterly in the here and now, and makes us forget our lessons, even as we return to how things always were. We take too much for granted; we lose our way. *Note: this one feels like it should be first or last, a complete return to how things always were. With enough rules, even rulers become slaves, and all the old guard wander in lost memories. It’s the too-young, those too fresh to have known anything else, that begin the coup, but all they know is how to prepare and destroy. Chaos? Yes! The climactic Big Bang, a fecund reset. Forced dominion toils to keep order, but true royalty has no need for force. Rulers naturally assume their role, and all rule their own proper domain; as planets in their orbits, all take care of their own work, honest and pure. Independent success, all for the sake of the All. The Work is easy to start, but hard to continue; hope flees and dread finds us instead. The plague of “what if?” seeps into us like polluted air into sod, turning fertile grass into barren dust. The Sun has set, but will rise again; keep going until dawn, for then there is hope. I was settling down this past Monday thinking of how to better explore the paths of the Tetractys. Pathworking is fine and all, and I will never swear against it; it’s a powerful method in its own right, and when tweaked for the purposes of mathesis, will provide valuable experience in developing oneself theurgically. The thing is that…well, I hate pathworking. It’s a personal opinion of mine that physical, enacted ritual is superior for initiations and transformation compared to pathworking, which is more meditative and exploratory but also too mental and ungrounded to achieve the same ends. Any physical addition to pathworking, such as using gestures or chanting, can definitely help empower the pathworking, but in the end it’s still primarily pathworking. I tried coming up with different kinds of chants or seed syllable-type intonations to focus oneself on a manifesting or manifested version of a path to little result (I’ll keep those notes as a draft post for future reference just in case), but something kept nagging at me to think of something better. Looking through my old drafts I had saved, I noticed that I started an idea a while back but never really fleshed it out any. The idea was to have a stellar type of ritual, not focused on the planets or elements themselves but on the passage of the Sun as it travels from one sign of the Zodiac to the next. After all, the whole point of the Gnosis Schema is to develop the self theurgically by using a set of twelve paths to traverse the ten sphairai of the Tetractys, and these twelve paths are given to the signs of the Zodiac. If we consider ourselves as Suns, then the passage of the Sun through the Zodiac represents our own passage through Gnosis. By celebrating the ingress of the Sun into each sign of the Zodiac, we celebrate and open ourselves up to a whole new stage of our development, formally opening up new gates and roads for us to travel. This is an idea I wanted to develop, but I had little idea back then of how to actually go about building or thinking about such a ritual. I think it’s time now to do just that. Thus, at the beginning of Cancer 2017 and close to the start of a new mathetic year, let us now discuss αι Τελεται των Ηλιεισοδων (hai Teletai tōn Hēlieisodōn), the Rituals of the Solar Ingresses. The first day after the Sun has astrologically entered the sign proper. This is probably the most straightforward and obvious option, but we’d be careful to note that we’d mark this as the first sunrise coinciding with or falling immediately after the Sun’s entry to the sign. Thus, if the Sun enters Taurus sometime on a Monday night after sunset, even though Monday is the first day of Taurus according to the modern Western sense, we’d only celebrate this starting at Tuesday morning, at the start of the first full day of Taurus. The drawback is that such an ingress could occur at any time of the lunar month, which much of the rest of mathesis relies upon for its ritual timing. After all, the solar year and lunar year are not easily synced and need constant corrections to keep roughly together. The first Noumenia (start of the lunar month) while the Sun is in the sign. This makes sense from a grammatomantic calendar standpoint, as we could then dedicate the whole rest of the month to works relating to the specific sign that the Sun has entered into. However, this has a bit of a problem; the Noumenia could occur several weeks into the solar month of the zodiac sign, so we’d lose the “freshness” of the previous option. Additionally, with lunar months being shorter than a solar month, there is the possibility of having two Noumenias within a single solar month. In such a case, we’d only use the first one for our ingress ritual, but we’d know then that, if there’s another Noumenia just before the Sun changes sign, then the next one after the Sun enters the next sign would be late indeed. The day of the letter of the sign while the Sun is in the sign. For instance, if we’re celebrating the entry of the Sun into the sign of Taurus, we’d wait until the day of Γ, the letter associated with Taurus. Just as with the Noumenia, there is the possibility that there might be two such days with the same letter while the Sun is in the same sign due to the fact that the lunar month is shorter than a solar twelfth of a year. Further, just as with the Noumenia, this might position the day of the ritual rather late into the Sun’s travel into the sign. However, this has the benefit of associating the natural power of the lunar day of the month with the sign of the Sun itself, and with the “offset” this would introduce since each sign has a different letter, and thus a different day of the month, we could sidestep some of the issues introduced by using a fixed date of the lunar month viz. the Noumenia. This is just a small sample, but indicative of how close or far these lunar methods of reckoning a ritual date for the Sun’s ingress can vary compared to the exact solar date. Given these three methods, I’m most inclined to go with the first option, with the third a close contender. It would be nice to have this set of rituals synced to our already-established lunar calendar, but there’s too much variance with the lunar calendar to make it stick right. Plus, according to even the most basic of principles of astrological magic, the most powerful time for a zodiacal-solar ritual is (barring a proper solar election) at the first degree of the sign, considered its strongest, with its last few degrees considered its weakest. On these days of ingress, the ritual should be performed at sunrise, or as early in the day as possible; barring that, as close to the day of ingress as possible. I’d suppose that, so long as the ritual is performed sometime in the first ten or so days of the Sun’s ingress into the sign, the ritual can be considered valid, though it is best to do it ASAP. Of all these twelve days, it’s the day of the Ingress into Aries that is the most important. This day celebrates the Sun’s rebirth, and our own renewal into a new cycle of the Gnosis Schema from an old one. If only one ingress could be celebrated, it is this one. With a little more resources and time, the days of the Ingress into Aries, into Leo, and into Sagittarius are as important as each other and should be celebrated if all twelve cannot. Each of these ingresses marks the departure of the Sun from one set of four signs of the Zodiac into the next four after completing a whole elemental cycle; for us on the Gnosis schema, these ingresses mark our transition from one cycle to the next (Hot to Cold, Cold to Cosmic, Cosmic to Hot). With enough resources and time, each ingress day could be celebrated on its own as they arrive, each ingress marking the transition of the Sun from one sign to the next, and our own transition from one path to the next on the Gnosis Schema. Like with my self-initiation ritual into mathesis I discussed a while back, I’ll refrain from posting the specifics of what the ritual of solar ingress would specifically contain. I’ve got my reasons for doing so: this is all still highly experimental, this is still a mystery path, and…well, I’m far from done designing a complete ritual for such an event. However, I’ve got my ideas, and I’ll definitely detail those at a high level for the sake of discussion and thinking out things aloud. Unlike the solar rituals of the Egyptian priests who guided the Sun through the underworld, and unlike the harvest festivals of the old pagans and heathens, and unlike the celebration of neopagans who reflect on the story of the God and Goddess throughout the year, these rituals of solar ingress use the outer world as a symbol for internal development, and will be used to link one’s self to the cosmic forces at play as the Sun travels through the skies. In other words, by bringing ourselves into stronger alignment with the natural flow and rhythm of the cosmos, we take on the same development and live in a spiritually natural, balanced way that follows the course the gods themselves take. We do this by, yes, celebrating the entry of the Sun into a new zodiac sign every month to mark the passage of time, but this is just the external aspect of it; we emulate and, eventually, become the Sun itself as it opens each new gate and takes its first steps along each new path. By sharing in the work of the gods, new possibilities are opened unto us, granting us new power and responsibilities each step of the way. As the Sun ages through one sign of the Zodiac, the power of the Sun is generally seen to decrease slightly; the final degrees of a sign are the weakest and darkest, and generally bode no good things. As the Sun enters a new sign, the Sun’s light is strengthened and renewed each and every time; further, this whole process is repeated on a grander scale of the whole year as the Sun shines brightest in summer, diminishes in autumn, becomes darkest and feeblest in winter, and becomes renewed in the spring. Just as Apollo is pulled ahead by the horses of his chariot, so too are we pulled forward by the powers of time and growth; just as Apollo is led by Hermes to his destinations hither and fro, so too are we pulled ahead by Hermes as guide and protector. It is these two gods that mathesis works intensely with, and we can already see roles for them appearing in these rituals of solar ingress: Apollo to cleanse and renew us for entering a new gate, and Hermes to guide and lead us as we take our first steps on a new path. Thus, each ritual of solar ingress must be preceded by a purification, either by khernimma or katharmos, so that we can enter a new stage of our lives clean and proper. We must then call on Hermes to open the gate itself and set us on the right path so that we do not get waylaid, lost, or trapped by the darkness that surrounds us. What I don’t yet know about including, and this is where pathworking will come in help, is the notion of a guardian or gatekeeper for each of these gates. After all, all gates have some sort of protection for themselves, and the notion of a being or god dwelling within each path against which one must pass a test is not precisely new; yes, the idea is common in Golden Dawn practices, but the idea of a Sphinx posing riddles is old. We do know that each of the twelve signs of the Zodiac is given to one of the twelve gods of Olympus, saith Cornelius Agrippa in his Orphic Scale of Twelve, but I’m not sure if these would be the same thing. Additionally, I’m uncertain of what specific offerings should be made as part of the ritual besides the usual ones. This is all for future development, planning, and pathworking to see what I can see and find out what can be found out and pieced together. After all, while I may experiment with different ritual layouts, I’d like to start doing these in earnest starting at the spring equinox next year for Aries. This gives me more than half a year’s time to try things out, which sounds like a lot of time, but…we’ll see. These rituals of solar ingress are intended to open the gates and let flow the power along the channels indicated by the paths on the Tetractys. What they allow us to do is to help guide us along the Gnosis Schema around the Tetractys, but they do not open up each of the sphairai to us. These rituals can open the gate to a new path, and can bring us to the gate at the end of the path to a new sphaira, but without us unlocking that final gate, we are not able to continue along the Gnosis Schema. Merely celebrating the rituals of solar ingress is not enough to deliver us to gnosis; these rituals are monthly rites of passage, but like any rite of passage, they only give us license to do more things without specifying how or in what timeframe. Anyone in a culture who undergoes the rite of passage into adulthood does not have their entire lives mapped out for them from that moment on; it only gives them the ability and recognition of adulthood, with all its privileges and responsibilities. Over the course of the year, as we celebrate the rituals of solar ingress, we open the ways for us to travel to each sphaira in turn, but we must still walk the path and, moreover, undergo the process of unlocking and experiencing each sphaira on the Tetractys, each of these ten stages of life and development. This would be a separate ritual, which I’ve not quite yet had plans for, but it makes sense. In addition to the usual pathworking and astral crap that goes along with all of this, of course. Alright, time to actually talk practice again. The past few posts were heavy on number theory, but the end of the last post touched on how it impacts our traversal of the Tetractys and how we can start thinking of numbers in terms of how we can actually use them for our spiritual progression. So, disclaimer, guys: although this post is going to be on pathworking, astral/clairvoyant exploration, and similar topics, I make no claims to being an expert on this. Although pathworking is not something foreign to me, it’s something that I underutilize in my work, if not outright ignore, even though I recognize the usefulness of it. I’m geared more towards physical ritual, but astral exploration is something I’d like to get more into. To that end, Tetractyean pathworking, yay! Sit or lie in a comfortable position. Clear the mind and regulate the breath. Visualize the symbol to be contemplated as clearly as you can. Focus on the symbol becoming as real as possible in the mind. Vizualize a door, gate, veil, or curtain on which the symbol is written, engraved, embroidered, or whatever. Let the symbol to be contemplated mark the gate as the entry to the “world” of that symbol. You might picture the same door each time, or let the door form on its own around the symbol. Once both the symbol and the gate are fully realized in the mind, open the gate (or have it open) and step through it. Explore the world of the symbol. Take note of all you perceive, and interact with the world as desired. When ready to leave, exit the world by taking the same path backwards, passing by each thing that was encountered on the way in until you reach the gate. Exit through the gate back into your own headspace, and close the gate. Visualize the gate dissolving into the symbol itself so that only the symbol remains. Visualize the symbol disseminating into one’s own sphere to as to retain the power and lessons learned from the contemplation. You can use this with any set of symbols, from the seals of spirits to the geomantic figures to the planetary sigils from Agrippa to Greek letter or Tarot cards. It’s a very malleable process that doesn’t rely much on ritual, if at all, though it can certainly be augmented by it through the use of mind-enhancing incenses, consecrated candles or oils, preliminary chants, and the like. However, what this process best benefits from is preliminary study of the symbol. What is the symbol’s name? What spirits is it associated with? What planets, elements, animals, plants, stones, forces, stars, and numbers is it associated with? What mythic figures from different religions does it connect to? In other words, it’s a vital, crucial part of the process to understand the correspondences of the symbol first. You don’t need to see how they all interact with each other; I can hardly tell you how or why the twelve tribes of Israel are associated with the Zodiac signs the way they are, but they’re there for a reason. It’s the astral exploration and contemplation that help with understanding the subtle interactions of everything, and give one a deeper knowledge of the symbol by means of experience. So, let’s review our map, the Tetractys with the paths of letters. As before, there are two main sets of paths, the Gnosis Schema with its Mitsubishi-like turns, and the Agnosis Schema with its hexagram-hexagon set. The difference between the Gnosis and Agnosis Schemata involve the kind of force associated with each schema, as well as what sphairai they reach. The Gnosis Schema is based on the twelve signs of the Zodiac, one step for every sign, as the student travels around the Tetractys. The Agnosis Schema, on the other hand, contains the non-zodiacal forces: the seven planets and the four elements plus the quintessence of Spirit. This is where one can get trapped in the cycles of this world, buffeted around by the archons and cruel fate; the Gnosis Schema, on the other hand, indicates the natural, fluid, smooth passage through all aspects of the cosmos up to and including purest Divinity, where we take the reins of our chariot and proceed on our true path to accomplish our One Thing. Let’s focus first on the twelve paths of the Gnosis Schema. Each path has an associated letter, and each letter with a sign of the Zodiac. 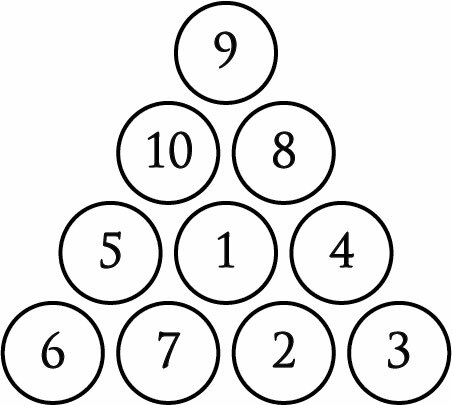 If we use Agrippa’s Orphic Scale of Twelve, we already have a wealth of symbolic knowledge on each path, to say nothing of what Liber 777 or other books of correspondence can get us. However, the number 12 isn’t strictly given to the Zodiac, even in Hellenic reckoning. There’s also the notion of the Twelve Labors of Heracles (of which the Thelemites have a fascinating view), and some medieval alchemists considered the Great Work to be composed of twelve stages, such as the Gates of George Ripley or the Keys of Basil Valentine. All these can be considered as a single group, quest, set of paths, tasks, or transformations required to traverse the entirety of the Tetractys by means of the Gnosis Schema. What of the Agnosis Schema, then? The Agnosis Schema isn’t just one set of forces; in fact, according to how things are set up on the Tetractys, we can divvy these twelve forces up into three groups of four. The first set, known as the Ideal forces, are the four elements themselves: Fire, Air, Water, and Earth. The second set, the Empyrean set, are the two luminaries, the planet Mercury, and the quasi-element quasi-planet quasi-force Quintessence, aka Spirit. The third set, the Ouranic forces, are the other four non-luminary planets of Venus, Mars, Jupiter, and Saturn. The four elements and the seven planets all have their usual correspondences (cf. Agrippa’s Scale of Four and Scale of Seven plus, like, literally everything else written in the Western and Near Eastern occult corpus for 5000 years, give or take a millennium), but it’s that last force of Spirit that kinda confuses things a bit. Spirit wasn’t really considered a separate force way back when; sure, as there are five Platonic solids mentioned in Plato’s Timaeus, there was a notion of a fifth…something out there, but it wasn’t considered to be an element like how Fire or Water was. Nor was it a visible object in the night sky like the planets or stars, however Plato claims that this force decorated the entire cosmos. I claim that Spirit is best seen as a median between the elements and planets, or a substrate underlying any other force out there, a type of non-materialized metaforce required for the materialization of anything else. It’s like how, in order for an object to exist, there must exist a space for it to be present. That kind of thing. You can figure out the rest. 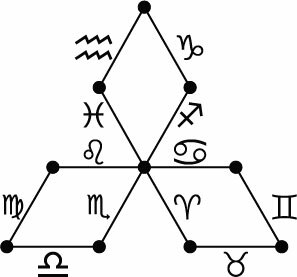 However, in addition to the zodiacal, planetary, and elemental forces, each path on the Tetractys is given one of the 24 Greek letters (indeed, this was really the whole impetus for having the paths to begin with). Each Greek letter can be viewed in different ways. The first three of these are fairly mundane: the name, the glyph, and the sound of the specific letter, all of which are given on a post way back when I first started considering the Greek letters as a vehicle for theurgy. Okay, so. At this point, I’d normally provide a table listing all the correspondences I’ve just mentioned to recap them all, but…the format of my blog would have this table run off the column of this text into the wild unknown, and gods only know what havoc it’d wreak on any number of RSS feeds, so I’m going to refrain from doing so this once. I mean, if you wanted a table of correspondences that big, just get a copy of Skinner’s Complete Magician’s Tables. Maybe, one day, I’ll publish my own focusing more on the Greek letters than Hebrew, but that’s not now. Instead, go ahead and take a gander at all the links I’ve posted above and feed your hungry mind on the connections of the paths to the letters and to the forces and to everything else. Study hard, kids. That’s important, no matter what you do in the occult. Preparation of the physical temple and the pathworker. Visualization of the origin of the pathworking. Invocation of the forces of the path to be worked. The departure onto the path from the origin. The vision of the path. The arrival from the path unto the destination. The return to the world and normal consciousness. Now, we can’t simply replace all the qabbalistic elements with mathetic ones; in many cases, I simply haven’t developed all the same things, and in others, I have no need to. However, the underlying idea is the same, and many of the same methods can be adapted to this. The important part that needs to be figured out first, however, is…where exactly do we start? The whole point of undergoing initiation into the Gnosis Schema is to bring us from wherever we might be on the Agnosis Schema to the central sphaira on the Gnosis Schema. Before that point, we don’t know where we are or how we got there; we need to be brought to a point of balance so as to be able to grow from that point, rather than trying to catch our bearings while we’re lost adrift on stormy seas. After initiation, we find ourselves at the central sphaira, which has six paths leading to it all, all equally spread apart. Thus, we begin at the sphaira of Mercury, and thence proceed onward to the path of Beta, which leads us down to the sphaira of Jupiter/Air. We repeat the process time and again, periodically returning to Mercury, and continue along our paths. Around you is a forum, a marketplace, filled with stalls and tents and shops all around you. For some, these stalls are each manned and staffed with heaps of all sorts of foods, spices, riches, and goods; for others, the marketplace is deserted and dilapidated, with it looking more like a shantytown full of ghosts. In either case, you stand at the center of three roads crossing each other in six directions. The sky has the usual weather, the air balmy and breezy, and the road is full of dust sweeping in from each of the roads to the center where you now stand. At the very center of the marketplace, in the exact middle of this six-way crossroads, stands a tall brazier atop a round altar. This brazier has a fire lit of pure white gold flame, gently warming but weak. Each road is lined with stalls and shops, though they start becoming fewer and farther between the further you look down each road. Looking down one of the roads in the direction of the morning sun, you see at the far end of it, where the shops and buildings and tents give way to grass and rocks and dirt roads, a tall stone arch glittering in the light of the sky. As you walk down this path, the bustle and business of the marketplace (or, alternatively, the whispers of wind and loose tentcloth) die down to silence, almost in anticipation of you reaching the arch. As you get closer to the arch and further from the tents, you see that the arch leads onto a bridge crossing a deep chasm, heading off around you to both the left and the right. The whole marketplace is on a large island, cut off from the surrounding lands yet connected by means of these six arches and their bridges wide enough to carry travelers, merchants, pilgrims, warlords, princes, paupers, and others of all kinds and nations. Yet, these bridges are all but empty. Beyond, however, you can see a whole new world through the arch, hearing all sorts of new voices and sounds, yet somehow it was not apparent to you until you looked through the arch itself. The arch is elaborate, delicately engraved with repetitive motifs echoing long-lost languages that yet look familiar to you, mixed in with baroque depictions of cities, wars, crops, livestock, wildlands, gods above and below, and so many other scenes that could never be descried except at close distance, and at a close enough distance, you see all these patterns forming an infinitely-detailed fractal building upon and within itself endlessly. At the very top of the arch, you see that the whole arch has been engraved with the ancient Greek letter Β; under it, suspended by gilded iron chains, is a brightly-gleaming lantern. It has not been lit, though you can tell from the slow way it sways that it is full of oil and ready to be ignited at a moment’s notice. Just above where the flame would be is a rope, tied to both columns supporting the arch, and from that rope a gate that, although fine and delicately-wrought, prevents you from passing through the arch proper. Light the lamp and let its light beckon to those who would seek to enter, guided and amplified by the white gold flame in the crossroads. Burn the rope, and bring down the gate. Open the path to this new road and to this new world. Leave the town as you are, and return when you are not. …a bit of fancy prose, sure, but why not? I don’t have much else to go on at the moment. Besides, when I do get around to actually exploring the central sphaira, I’ll be able to get a better vision of the place and use that as the preliminary setup for a “mathetic temple”. The use of the “gate blocking the arch” bit was to show that one cannot simply proceed immediately without doing work to earn the right of passage upon the path; in the Golden Dawn style of pathworking, each path had its own guard that needed to be appeased or tested first before one could go along the path. Similar things should apply here, I figure, though the methods of testing would likely be different. Plus, I might actually become inspired enough to give the damn thing its own proper name and title, as opposed to just calling it the “central sphaira” or “sphaira of Mercury”. There hasn’t been much talk here about the paths themselves on the Tetractys since we figured out a way to associate letters to them. Largely, this is because I’ve had a hard time figuring out where to start. I mean, I developed the whole mathesis thing out of a need to work with a Greek system of paths between the spheres on the Tree of Life, yet never actually did much pathworking or meditation on the paths themselves on the Kircher Tree (which, though it goes against my usual advice, I think was justified here). I know that the paths describe a means of change and evolution from one emanation to the next, yet beyond that…it was hard to say. Since then, I’ve been looking at the Tetractys and trying to figure out where to start. 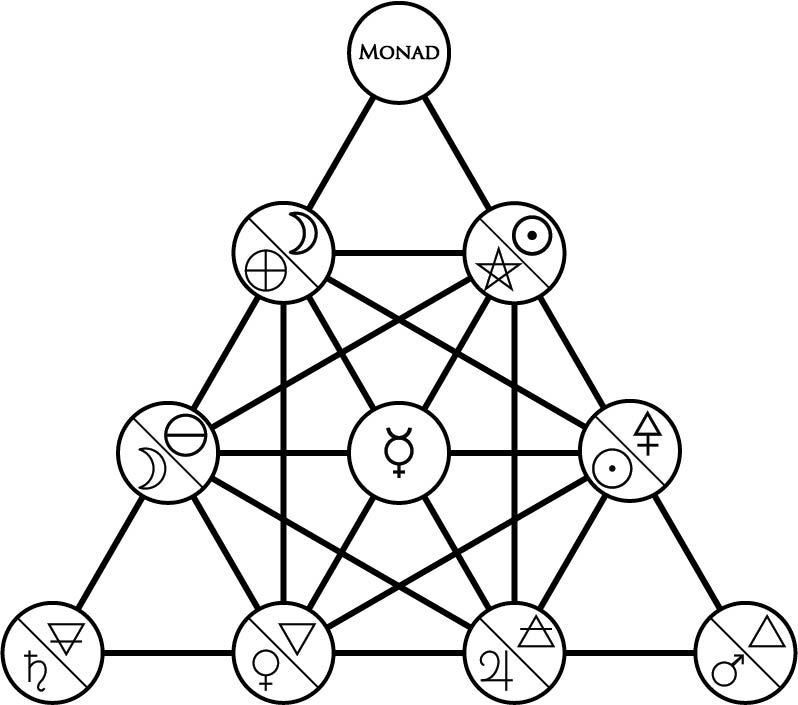 Unlike the Tree of Life in qabbalah that so conveniently gives us Malkuth as the starting line for our Work, the Tetractys doesn’t have anything so readily apparent. Then again, the answer was literally staring out at me from the middle of the whole thing, and it’d be a shame for me to ignore my own patron god Hermes at this point. Starting with that brief moment of inspiration, I started from the middle of the Tetractys and worked my way out, and now I’ve ended up developing a way to traverse the sphairai on the Tetractys of Life in an ordered and coherent way. Bear with me guys, because this post is going to be a little lengthy to get all my thoughts out. I’ll bet you’re confused. For one, we have twelve spheres listed, with Mercury being listed three times; shouldn’t we have to go through each sphere only once? Second, we’re starting with Mercury and not the Monad; shouldn’t we start with the Monad being the All and the Source of all? Well, sorta. I’ll admit, my background in qabbalah was inhibiting me from running with this sequence of paths, but then, mathesis is not qabbalah, and the Tetractys is not the Tree. In Hermetic qabbalah or Jewish kabbalah, we have a clearly defined start and end, a Source and a Destination, and either of them will be Kether or Malkuth depending on whether you’re going up or down the Tree. However, while the Tree is like an elaborate map, the Tetractys presents us with something different, like a blueprint. Instead of showing how things come to be in a linear fashion, the Tetractys shows the presence and building blocks of life present in all things; the Tetractys shows how things come to be in a nonlinear fashion. There is no single end goal with the Tetractys; the Monad descends into the Tetrad, not any one of the four elements alone. All the parts of the Tetractys must be constantly and repeatedly traversed to become complete both of ourselves and of the cosmos, encompassing all aspects of the act, process, and result of Creation. The Hot System involves the active principles of Air, Fire, and Sulfur. Processes of power, actively causing change. The Cosmic System involves the encompassing principles of Light, the Monad, and Darkness. Processes of cosmic stasis and unity. In each case, we both start and end at Mercury, both astrologically and alchemically, being the center and present in nearly all things except the purest and most extreme of all elements: Earth, Fire, and the Source itself. Everything else is connected with Mercury, so it makes sense that it’s the only one that can reasonably allow us to translate between the three systems. Yes, we can go from Water to Air (traversing the Cold and Hot Systems directly), Sulfur to Light (Hot and Cosmic), or Salt to Darkness (Cold and Whole), but a better balance can be preserved and future progress can be assured by always returning to Mercury. If we spend some time in the Hot System, we should pass from Sulfur through Mercury to Salt, because Mercury is what naturally balances the two forces. At the end of the Cold System, we pass from Water/Venus to Light/Stars; though it’s not immediately apparent how Mercury balances these two, consider the myth of Aphrodite being born from Ocean (Water) from the remains of Ouranos (Sky); the ability to create physically comes from supercelestial impetus and the latter is accomplished by the former, but also consider the endless horizon is the meeting point of the two realms. At the end of the Cosmic System, we proceed from Darkness to Air; again, an awkward comparison to make, but recall that in the Poemander myth of creation, air is what separated the heavens from the mixed mass that would eventually become the Earth, and the ability to begin the process of rising and falling through the spheres is accomplished by means of air as an intermediary. Mercury is a symbol of strong change, but not in a way that changes something into its direct opposite; rather, Mercury changes something into its complement, something that completes and links the two systems together. The use of systems here isn’t just to provide a way to go through all the sphairai of the Tetractys in one go. Rather, within each system are four sphairai and four paths, forming a kind of mini-tetractys within each system in a mini-cycle. While one can traverse each system once to complete the whole Tetractys, I see it being worthwhile to cycle through each system several times to really grok and complete the work that needs to be done in each. If we consider the three phases of alchemy (nigredo, albedo, rubdeo), then each system can be viewed as one of these stages, and it may take time for the Work from each phase to settle in. Going through each stage of the work thoroughly requires several iterations; for instance, cycling through the Hot system four times would yield a pass each to focus on the ideas of Hot, Hot-Air, Hot-Fire, and Hot-Sulfur. By cycling not only through the Tetractys as a whole but within each system on the Tetractys, we can begin to fully understand each force in its entirety and on its own terms. And, after this, we’d repeat the whole thing over again as many times as desired or as necessary until we achieve the Great Work. Besides, by completely cycling through the whole Tetractys (at least in the Hermetic Initiation) starting and ending with Mercury, we hit Mercury four times, and four is a number mythologically sacred to Hermes. And, if we consider all the Initiation passes together, we pass through the entire Tetractys a total of five times. So, in this manner, we have a set of twelve paths traversing three systems within the Tetractys. Each system is composed of four sphairai, all starting with and ending with Mercury; Mercury is then a liminal point between the three “worlds”, both starting and ending each set of paths within an system. We constantly proceed from and return to Mercury as a central hub or nexus. However, with our twelve Mitsubishi paths, we leave another set of twelve paths unused. What are these paths? 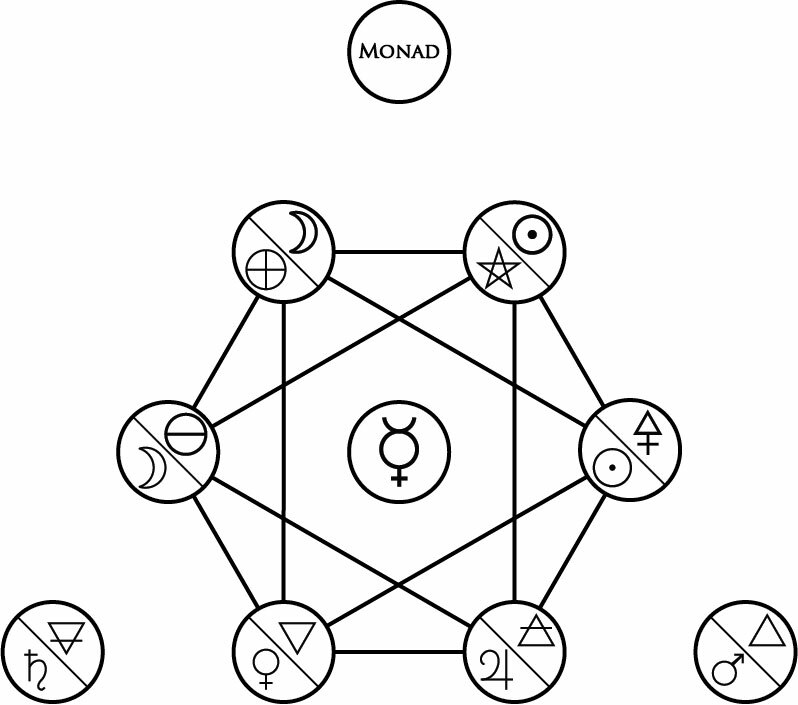 These twelve paths never touch central Mercury or the extreme Earth, Fire, or Monad sphairai at all, but instead connect the six “middling” sphairai of Darkness, Salt, Water, Air, Sulfur, and Light. Two cycles are presented here, shown by the hexagram paths (inner cycle) and hexagon paths (outer cycle). Instead of having systems, we have one group of six sphairai that are each connected to everything but their complement (e.g. Salt and Sulfur, Water and Light) and four leftovers that are unconnected which would link everything else together. Rather than getting us to henosis and the Monad, or alternatively to a fundamental understanding of how our cosmos works through Earth and Fire, these cycles keep us trapped, never able to each any extreme and never having the ability to reasonably transform ourselves into anything we need to progress. Note that two of the sphairai, the Monad and Mercury, are essentially the same when it comes to what their force is: the planetary force of Mercury and the alchemical force of Mercury are so close that they’re conceptually synonymous. 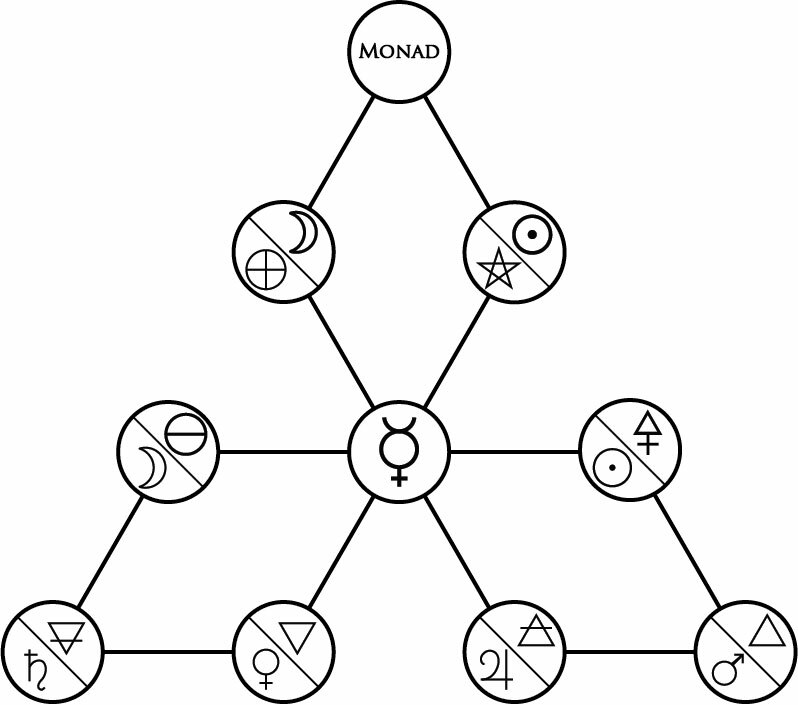 Likewise, the Monad is…well, the Monad. There’s literally only one Monad in any system of thought here. However, look at the numbers: we see two of the sphairai, those of Venus/Water and Darkness/World, have the same number in both systems. While these are the exceptions to the rule, they’re exceptions worth noticing. That Darkness/World is 10, the final stage in the emanatory process, is unsurprising; it is completion, it is the ending, it is the goal of creation to create the World. Although it is present in the Dyad in contrast to Light/Fixed Stars and thus “comes first” before anything lower, the entirety of the World can only exist when all the other forces are present to give it life, animacy, and agency. As for Water/Venus, it’s interesting that it’s kept the number seven between the two, that of essence and quality of life. It’s low down on the Tetractys as part of the Tetrad, but all the same it’s vital to giving things animacy, as opposed to Darkness/World which is what is given animacy. Personally, I feel it appropriate to comment on what the Gnosis/Agnosis Schemas mean for the individual letters of the paths themselves. For instance, note that all the Air paths (letters Υ, Φ, Ψ, Σ, Δ, Μ) are all part of the Agnosis Schema, as well as the other fixed signs (letters Φ, Κ, Ν) as well as the other elemental paths (letters Χ, Ξ, Θ). The twelve letters that belong to the Gnosis path are Ο, Ζ, Π, Ε, Η, Λ, Τ, Ω, Α, Β, Ρ, and Ι, which are the six non-fixed non-Air signs and the six non-Jupiter planets. However, all I’ve done so far is figure out which abstract paths to take regardless of their letters; I fully expect my Tetractys of Life to have its letter-path assignments change over time as I fine tune and explore the system deeper. The system, as of now, is coherent and structured, which I like, but who knows whether it’s actually valid and practical to use. That’s what further writing and scrying is for, and now that I have an actual path to pathwork, I think that process should begin soon.